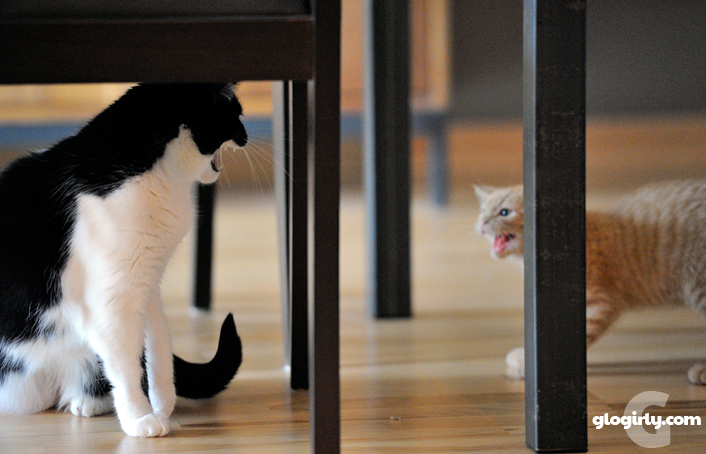 WAFFLES: So Boss, what's up with the Throwback Thursday pictures? It's Monday you know. 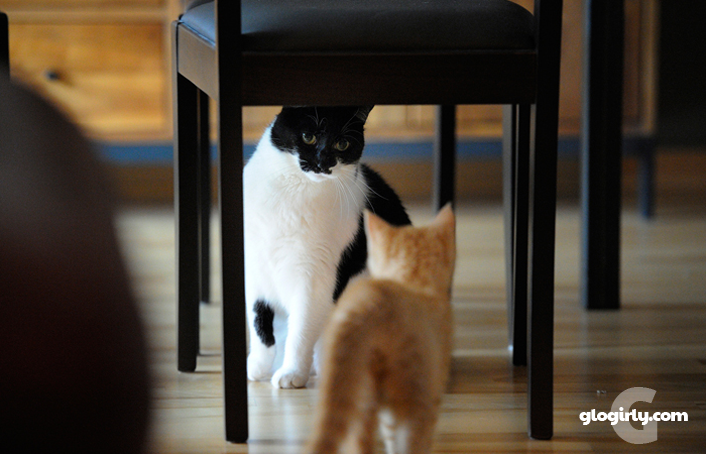 KATIE: Believe it or not Waffles, people are asking to see more of your kitten photos. Since we're only publishing on M-W-F, we have to get a little creative. WAFFLES: So does that mean today's Thursday? What happens when we get to Thursday? Will it be Monday? What about Friday? And Waffles Wednesday??? KATIE: Relax, Waffles. We're just sharing the photos of the day you and I met face to face for the first time. Remember? WAFFLES: I remember! That's when you taught me how to say hello. KATIE: And for once, you were a quick learner. WAFFLES: And then you taught me about wand toys. 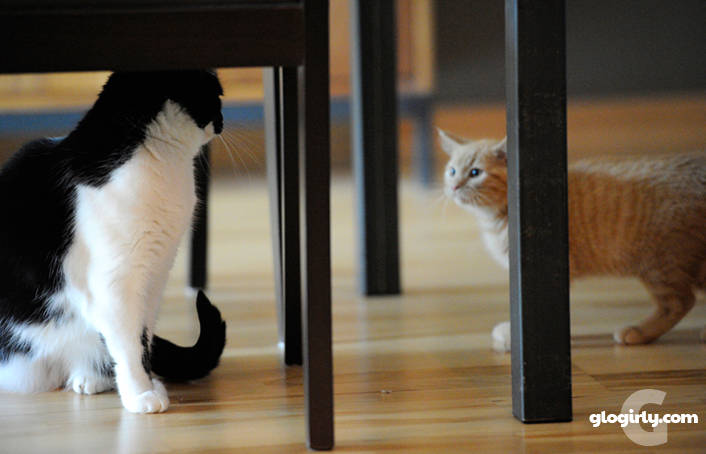 WAFFLES: –and what's yours is mine. I remember! KATIE: *sigh* Isn't that the truth. Almost three years ago, Waffles came home from the shelter to join our family. It was rough going at first. Glogirly set up our guest bedroom as a kitten quarantine room where he stayed for the first week. After a few days of Waffles and Katie peering at each other through a crack in the door, exploring each others digs in private, and lots of "oh, please let this work" prayers from Glogirly, the door opened. Permanently. Awwww, baby Waffles - always cute. Waffles, ya sure wuz a cute lil kitten! MOL - Katie, I see that your whapping paw was at the ready! The first time Binga waved her whapping paw at me, I rolled over on my back - that really confused her! Our Miranda whaps Harvey when he gets too close!! He's bigger than kitten Waffles tho'!! Squeeeeeeee!! Did you ever post pics of Katie as a baby and as an adult side by side and of Waffles too? I'd love to see them baby and adult side by side to see how they've grown. They are just so cute!! My orange Jack was in awe when we brought baby Benjamin home. It was love at first sight! 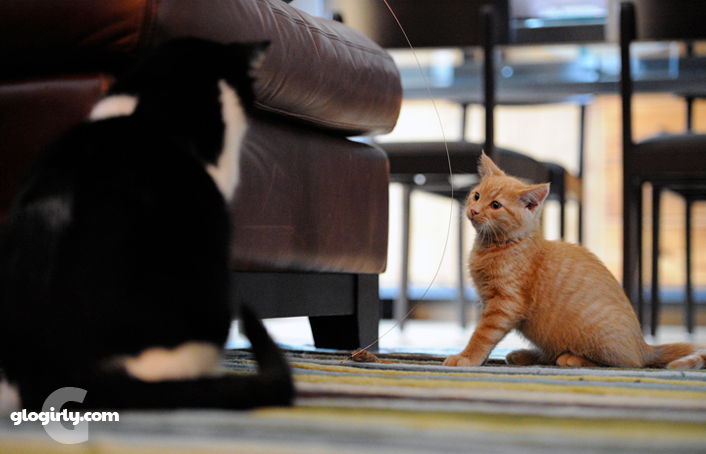 It was the most adorable first meeting. He wanted to be beside him all the time. I remember these lovely photos! It doesn't seem possible that it was nearly 3 years ago. How adorable. Have a great week. Thanks for showing us these. Bt I think Waffles will now be permanently confused about days of the week! Three years can go by in the blink of an eye and we love seeing flashback pictures. I can't believe it has been 3 years! 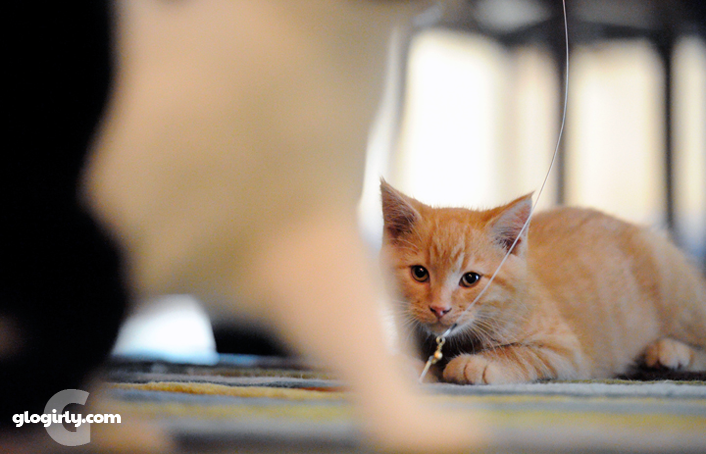 Waffles was anadorable kitten. I don't think we ever did see the first meet pictures, so seeing them now is a real treat. Wow! Has it been three years?! Katie, you've been a great boss! And we've enjoyed all three years of adorable Waffles and long-suffering Katie! Now living with Waffles - like Rufus the Red. Oh Katie remember the good ole days! Baby Waffles was just irresistible!!! Oh boy, I remember those days. Lexy taught me how to say hello, too. Lots of times! Oh I remember these! It is so hard to believe that Waffles was soooooooooo small! I had forgotten! Once you go Ornj, there's no going back! I wasn't a kitten when I first met Derby, but we had a few sparks too. Katie we are so glad you accepted baby Waffles. The youngsters really have a way at putting that spring back into your step, or in your case that whapping paw. MOL. Love you guys! Hi there. Lovely blog. Please visit my new cat blog [Click here]. MOL Oh da stories sis lexi kuld tell 'bout me Waffles and Katie. She was not a purrlease ladycat at all. MOL Now weez da bestest of furiends. Y'all always look gweat togevver. Cute! Can I see more kitten pictures of Katie please? MOL!